Inaugurated in 1935 in the very heart of Moscow, the legendary Moscow Hotel played host to an endless number of high-ranking party officials and foreign dignitaries throughout the Soviet era. The hotel was famous also for its asymmetric exterior. Its architect gave Stalin plans for two possible versions on the same sheet of paper. Stalin scrawled his signature over both and the architect, afraid to contradict him, combined the two styles. Now, after more than 10 years of reconstruction, the Moscow Hotel has been reborn as Four Seasons Hotel Moscow. The exterior façade has been replicated in meticulous detail, including the distinctive asymmetry between the two wings that surround a new glass-topped atrium. 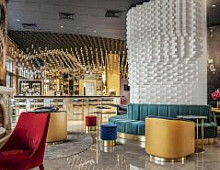 Whereas the original hotel housed 1,000 guest rooms and suites, the current five-star incarnation at 180 guest rooms and suites has some of the most spacious and luxury accommodation in the Russian capital. The hotel features three restaurants and two lounges, a large spa with 14 treatment rooms and indoor pool, and a conference centre with the Ball Room taking up to 400 delegates. 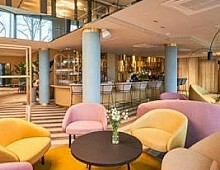 Four Seasons Hotel Moscow complements the newly opened Four Seasons Hotel Lion Palace St Petersburg, a careful restoration of a 19th century palace adjacent to St Isaac’s Cathedral. Paired together, these two luxury hotels offer a perfect opportunity to experience modern Russia’s delights while glimpsing its storied past.